Glacier Day Hiking Experience: All I Can Say Is Wow! 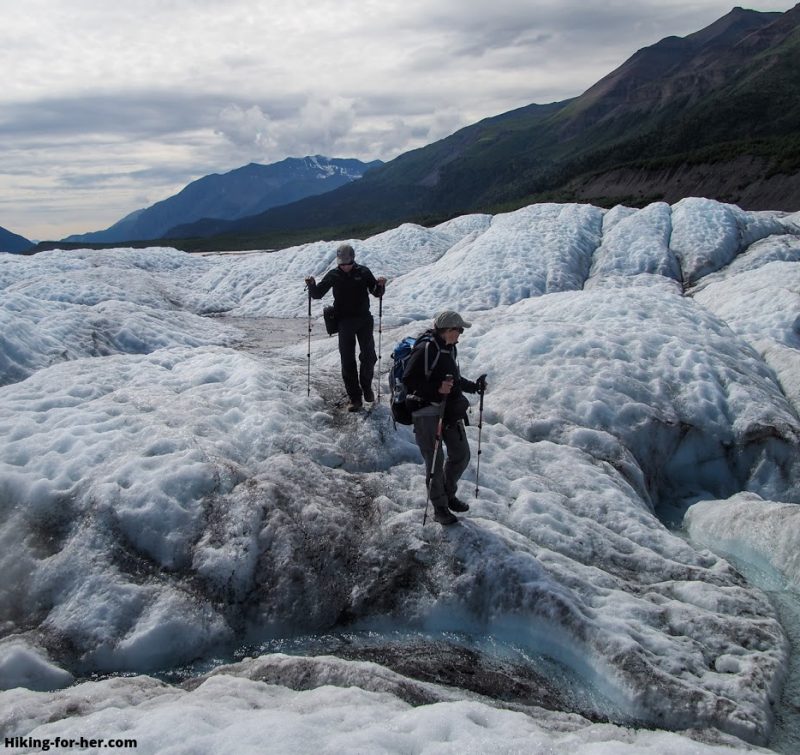 These glacier day hiking tips are meant to give you an accurate picture of what it's like to step onto a glacier and spend time exploring it. The limited amount of time I spent on this particular glacier lends itself more to the term glacier walking. And for the record, I'm no expert on this type of hiking. 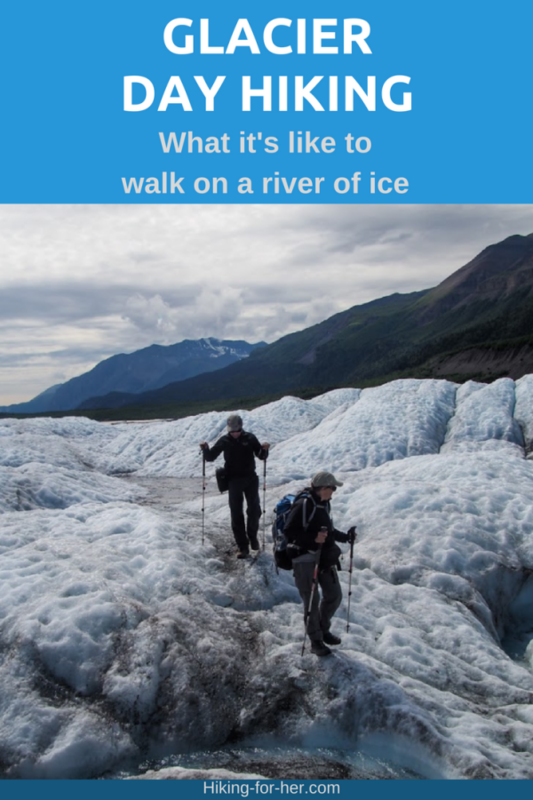 These tips are a compilation of my own brief experience with one river of ice in Alaska's Wrangell St. Elias Park, and do not reflect conditions in all parts of the world. My experience spanned four hours on a dry, calm July day. 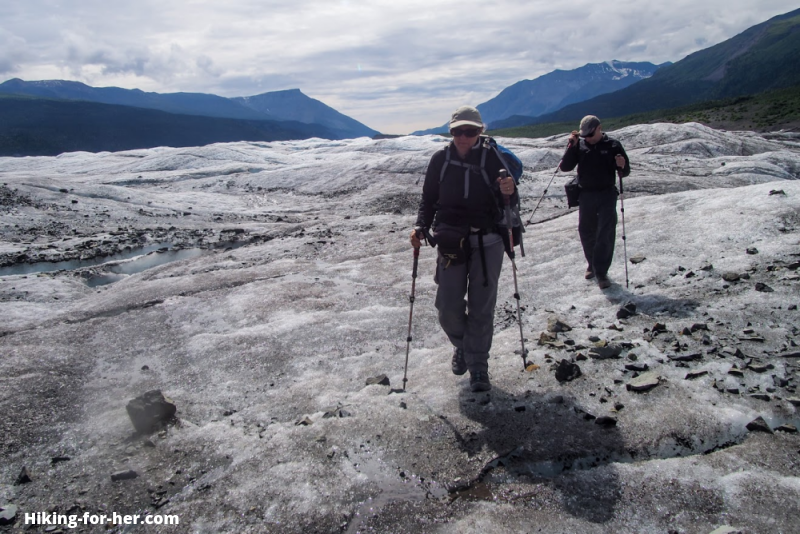 This is simply an eye witness report, to whet your appetite for safe glacier day hiking. 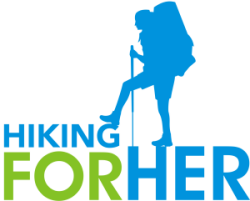 The hazards and pitfalls of this type of hiking are outlined in these glacier hiking tips to acquaint you with this unique type of hiking. But Hiking For Her is not responsible for any decisions you make about glacier travel after reading this trip report. 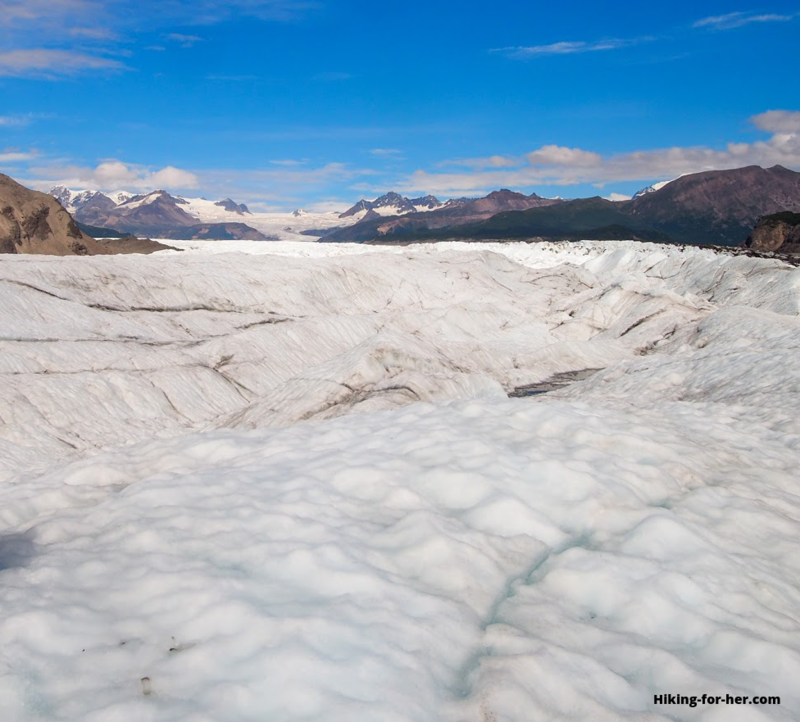 Wrangell St Elias National Park and Preserve (southeast Alaska) is blessed with a multitude of glaciers. The glacier I explored was the Nizina Glacier, accessed via bush plane from the town of McCarthy. Plus a long, rocky hike to its terminus. My guided exploration was part of a 12 day base camping trip in the Wrangells, July 2017. Or my Wrangell dayhiking tips here. Three of us hiked a big loop around the relatively flat terminal area of the glacier, so did not need to use crampons or ice axes. If it had rained recently, we would not have tried to access the glacier due to unstable surfaces around the access point and potentially hazardous slick, icy surfaces. That's a whole lotta glacier to explore! Geology has its own language, and you will need some toothy words to understand this glacier day hiking trip report. Glacial lakes and streams: melting water has to go somewhere! Just for the record, the Nizina Glacier is a temperate glacier, with frozen and liquid water during warm summer months. The Malaspina Glacier, which can be accessed elsewhere in the park, is a piedmont glacier: it terminates at the ocean. For an exhaustive glacier glossary, use this. Now you're ready for the description of my glacier hiking adventure! Looks deceptively easy, doesn't it! But keep a sharp eye out for surface water, crevasses, and slick spots. A big problem in glacier day hiking is how to get onto a glacier which sits higher than your access point. We solved the problem by hiking for a quarter mile on a lateral moraine, looking for a safe spot to access the glacier itself. Rock fall is common in this area, especially after the sun has had a chance to start warming up the rocks. Sun protection for eyes and skin is important to shield yourself from the UV rays bouncing around. The glacier had relatively few crevasses where we were exploring (good beta from our guide Rhane), all of which were easy to spot from a distance. Due to the warm cloudless weather, there were a lot of glacial rivers, streams and rivulets to cross or avoid. Throughout our hike, we were treated to deliciously pure glacial melt (actually, carefully aged H2O molecules finally liberated from the ice) in our water bottles! The dirty surface of the glacier means you stay upright as you walk. As a hiker, you've trained yourself to either avoid ice, or tread carefully when you have to traverse it. On a glacier, you can walk confidently on ice! But you need to be sure you've picked a relatively dry time to step onto it. Recent rain will slick up the ice and create treacherous walking conditions unless you wear crampons. Your first few steps on the glacier will probably be tentative. Then your brain switches over to "this is amazing!!!" and you can truck along at whatever speed the terrain and your curiosity permit. On a relatively flat glacier, crampons would just get in the way of exploration. As soon as you try to ascend or descend a steeply sloped glacial surface, they become vital for your safety. It really helps navigation if you've had a chance to fly over the glacier first. This was possible at the Nizina Glacier, because we camped at the glacier's Nizina Lake (pooled glacial melt water that creates a river at the outlet) after a fly over to scope out the landing strip. Surprisingly easy to keep your grip, thanks to dirt and debris under your boots. Note the glacial river in the foreground. Any time I can learn a few new hiking tricks, I jump at the chance. No jumping on the glacier was involved, but I certainly came away with a whole new appreciation for the power of hydrogen, oxygen, and cool temperatures! Stay tuned for a glacier day hiking video so you can experience the sounds and sights of glacier day hiking for yourself. New skills, new vocabulary, and a new way to explore Mother Earth, what are you waiting for?